The Belfast Roadshow took place in the western part of the city in a neighbourhood called Colin. The Colin community Hub donated a small, friendly and ideally located base. The City Vision concentrated on retrofitting appropriate active and passive systems to the many houses clustered in the north of Colin. The urban plan of these concentrated communities was originally designed for protection and lock down during ‘the troubles’. The urban solution was to carefully engage these areas with the redevelopment of a new commercial and pedestrian friendly high street. 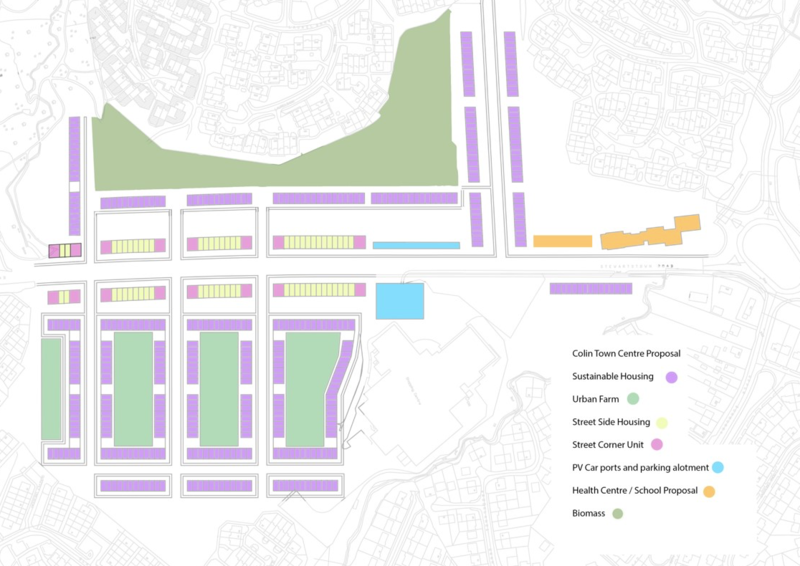 In addition, a new mixed-use energy and food productive residential landscape was proposed to lower laying south end of the environmentally upgraded high street. The original mind-set of the community would be to improve the logistics and speed of vacating Colin in order to get to the more vibrant and economically successful city centre of Belfast. The Roadshow’s city vision changed this perception physically and mentally by decelerating this migration by creating a environmentally friendly and family orientated landscape that vastly improved the economical potential of the area, encouraging both locals and visitor to stay within the community they love.